Oceanfront, Fabulous elevated home with outstanding ocean views in private community with communal pool and tennis courts. Beautiful heart pine flooring, large outdoor sundeck (up and down). Outside shower, CD Player, Flat screen TVs, Cable, DVD, VCR, WiFi, grill. Linens included. Pet Friendly with a $200 non-refundable fee. The square footage of this house is 2,193. Dining table seats 8. Additional seating for 3 at bar and seating for 4 at small table. Convenient location. Nice house on the beach. We had a great time. 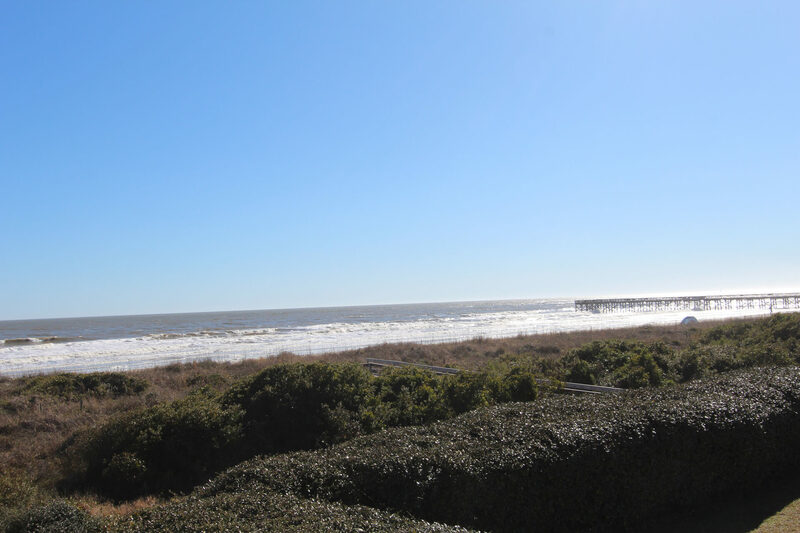 Perfect location on IOP. Could walk to everything we needed. House was large and well stocked kitchen. The only detractor was the chaos of check in at the office. We've been dealing with Island realty for 10 years. Delays in the 4 o'clock check in time are really not acceptable after long trips to arrive at IOP. This seems to be worsening with each passing year. 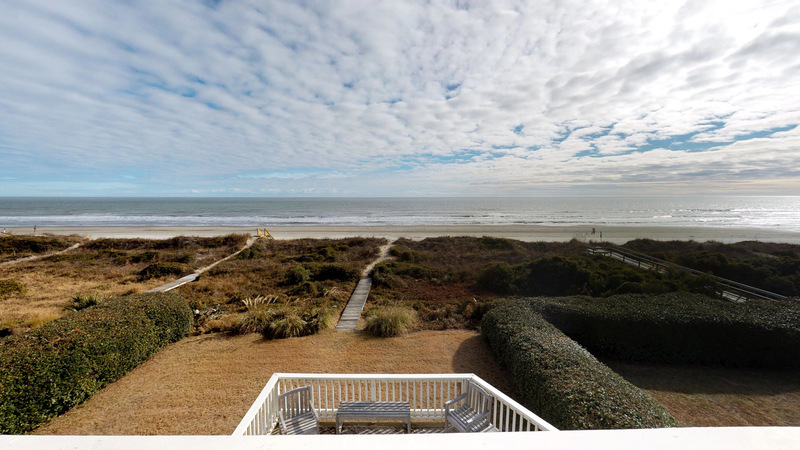 We had a great time at this beach front house in Isle of Palms. Great location, close to downtown, but still a calm, private setting. 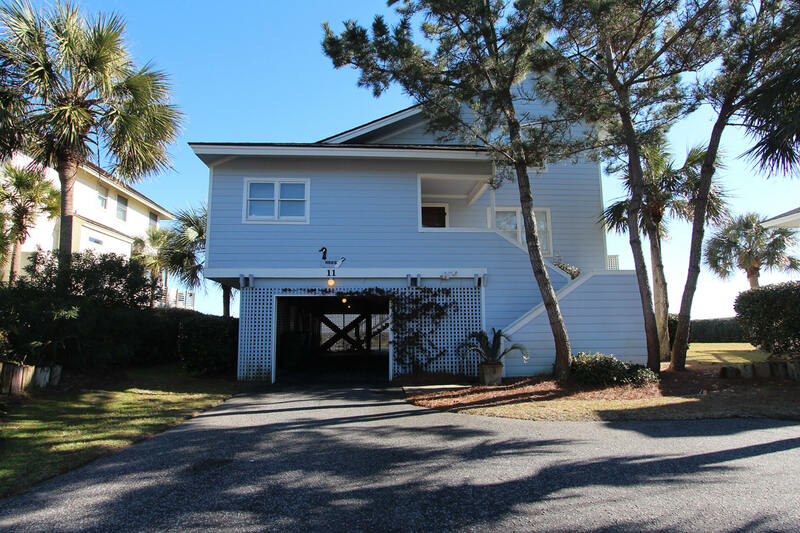 The house has great beach front views from the two master bedrooms including a great view of the sunrise from both decks. The house had plenty of room and the 4 (5 if you count the full outside bathroom) bathrooms made getting ready in the evening a breeze. Great place, lots of room, very clean and great location with ocean. Had great weather and our dogs loved it! We had a wonderful extended family vacation at 11 Sand Dune Ln. The house has a relaxed, unpretentious style, great views, oceanfront location on a private street, yet close to everything. Unfortunately, beach erosion made beach access challenging. Island Realty was super responsive with one minor issue we reported, very impressed with the excellent service. We also highly recommend the breakfast at Sea Biscuit Cafe. The property is beautiful but has a few maintenance issues that I brought to Island Realty's attention. They are usually very professional. I got the runaround when checking in which was unfortunate. Otherwise I would have given them a 5 instead of a 3. I'm sure they will take care of the maintenance issues and we will be back next year! Thank you for your comments. We are glad to hear you enjoyed your stay. I apologize for any delay in fixing the maintenance items, but rest assured they will be addressed. We look forward to seeing you again soon. Overall, we loved the house, its layout, comfortable furnishings and its location. Our only negative observations is that at this price point the bathrooms should be updated. And there is no excuse for a torn shower curtain and worn out bed pillows. Thank you for your comments. We are so glad to hear you enjoyed your stay. We will be certain to relay this information to the home owners in hopes of making improvements. Perfect setting for kids and grandkids. Also very convenient location for getting around to explore other areas. It's a wonderful spot - near downtown, close to grocery store and seafood store, but tucked away so there's no traffic noise. The weather this year was beautiful. The house is getting a little worn - the screen door in the upstairs bedroom kept falling off. The icemaker was broken. Unfortunately no windows could be opened (other than doors and sliding glass doors) because they were painted shut, and since the weather was really warm we could have used more ventilation. Also, needed an umbrella on the deck (that sun was hot!). All minor details. We love the house - it fits our needs perfectly. 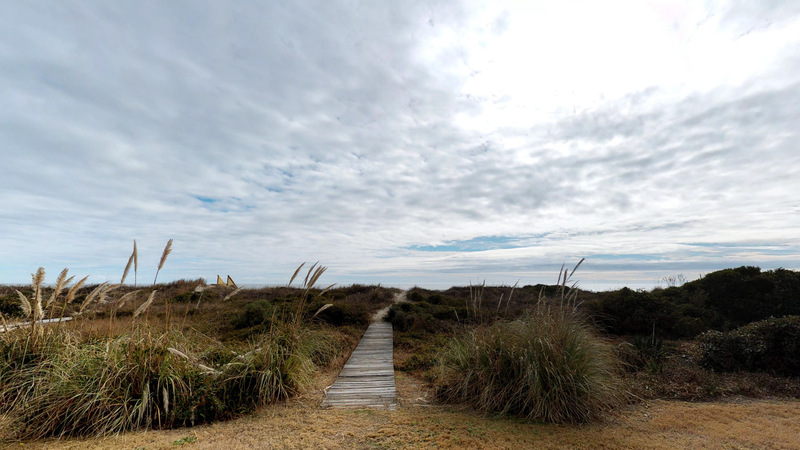 This is a great location in Isle of Palms. Island Realty was very professional and easy to work with. Second year in this great "home", hardly just a house. Personal touches make such a difference. Sorry to leave after only 3 days but left the house in battened- down shape. Will plan to come back next year, same week and hope not to evacuate again! House worked great for our family over Christmas. Lovely views of the ocean from the house with large windows...nice deck as well. Very short walk out to the beach. Kitchen was well equipped. Lovely ocean access by private walkway. Comfortable spaces with lots of windows overlooking the beach. Close to Charleston for fine dining and activities. Quiet private small community with tennis court and pool. This is the first time we have actually talked about returning to the same beach. We have visited other beaches but none of them really fit our family. The house really helped with this experience, it was perfect for a family of five. It is in a great location, clean and well supplied. For us this was the first time we had a washer and drier available for our use which was very nice to have.The view of the ocean was incredible. It was a perfect location and we loved the house! Five stars all around. All the comforts of home but with a much nicer view. Having the beach access so close with 3 little kids was very convenient. Also the nice yard for the little ones to play in. We truly enjoyed our stay in this home and found the location to be perfect for our needs. The cul-de-sac make it great for our children to ride their bikes and my daughter learned to ride without training wheels directly on the beach. What a great memory! We had a problem with the dishwasher but Island Realty took care of it immediately. We look forward to coming back next year and would absolutely refer this property to friends.